CES 2010: Why do I let Dale convince me to look stupid? Seriously, this is becoming a real problem. There are some pictures from this trip where I'm made to look like an idiot that you guys are never going to see. Ever. In fact, I'm going to go and delete them from his camera right now so that they can't be used as blackmail at a later date. That goat will never be the same. 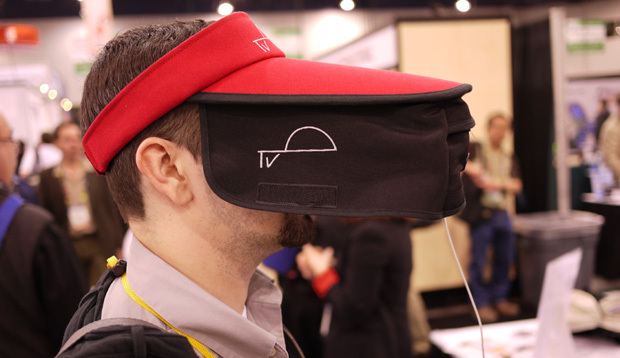 In the hall of oddities that is the North Hall of CES, we came across this ridiculous hat. What you can't see from the above image is that it's designed to house an iPhone at the front of the brim. The idea is that you can use it to watch whatever it is people watch on iPhones (you know what my guess is) without disturbing others or dealing with other visual distractions. I have to admit, though, video did actually look pretty damn good while wearing the thing. Nevertheless, I want to know who buys this. I demand names. Of course, I would have said something similar about the Snuggie (Ion Audio is making an electric variety which I recommend you wear in the tub1) never suspecting that my list of "people to maim" could have grown so great and so quickly. 1Wearing an electric Snuggie in a bathtub filled with water will probably kill you, which I feel compelled to mention because I live in America. So, I'm not actually recommending it because I don't want to get sued.